Given that the Millennials form the largest generation of the work force retaining them is that much more difficult especially since multiple reports show that they are switching jobs more often than the previous generations. According to Gallup, 60% of Millennials are open to new job opportunities right now. On an average these individuals will have 4 different jobs before the age of 32 and as many as 20 within a lifetime. Therefore, formulating a retention strategy is essential to any organisations growth. Where Millennials retention is considered it is important to find out the reasons behind why they are job hopping and what is it they want. Many surveys have cited reasons like lack of engagement at work, the recession or simply that switching jobs is a faster way to climb the ranks and get a pay raise. Other reasons for job hopping is that according to a FlexJobs Survey 84% of Millennials cited work-life balance as the primary factor and 82% of them cited work flexibility as a secondary factor when they consider a job. Additionally, 50% of Millennials say they are willing to take a pay cut to find work that matches their values while 94% want to use their skills for good and seven-in-ten say this is “very important” to them and 31% percent say it is “essential”. The aspects mentioned above brings us one step closer to finding out what they actually want. Luckily, we @SourcingAdda have anticipated this development and thus addressed the concern of Talent Acquisitionist. 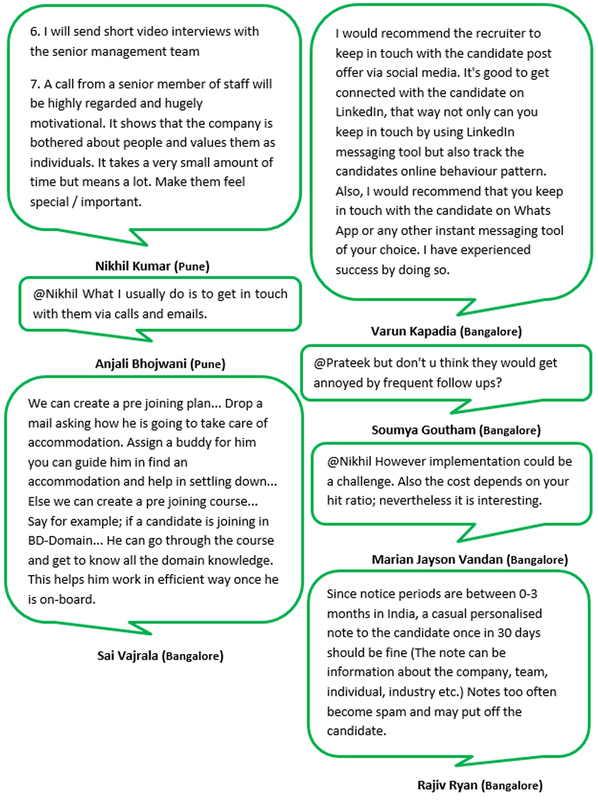 And thanks to Ramya one of our Bangalore group member’s suggestion to discuss on, “Best industry practices in the types of rewards (monetary, non – monetary) that an organisation should have to retain Millennial’s” we are able to be of some assistance by providing a more practical approach with the discussion responses below for your review…. Based on the statistical data and the practical solutions mentioned it is safe to say that you are dealing with individuals that value working for a cause or appreciation. Some other alternative or proven rewards are the monitory incentive schemes, or vouchers or gadgets like speakers, mobile accessories, storage devices, etc. while the non – monitory rewards like work-life balance or flexible work hours have proven to be very effective and are supported by the stats mentioned earlier. Well there you have at least some ideas as to how you can prevent Millennials from Job Hopping thus having a better chance at retaining them. The Talent Acquisition profession like any other also has its ups and downs especially when sourcing for specific types of Talent. 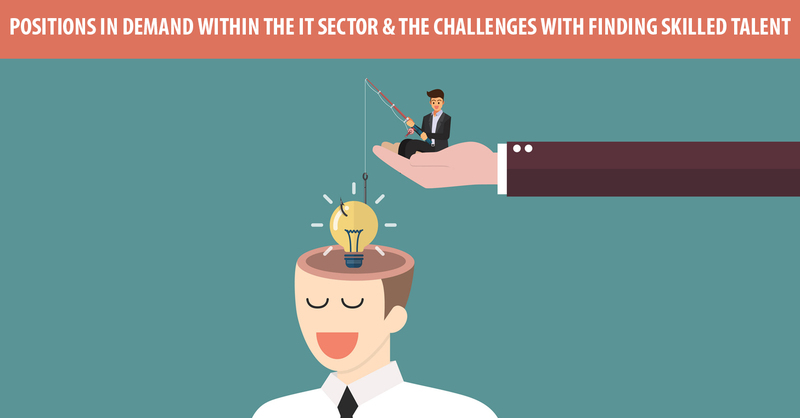 Particularly sourcing for talent pertaining to the IT Sector it’s of course a challenge for most Talent Acquisitionist’s. It’s difficult probably because the demand for such talent outweighs the supply to a great extent hence it poses a challenge and one that cannot be resolved easily. 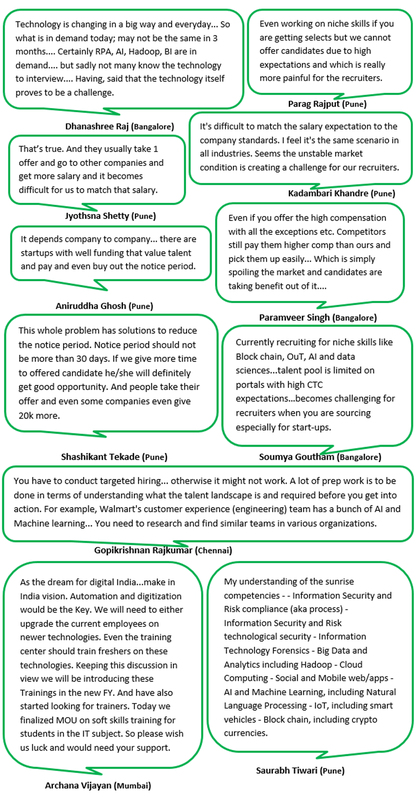 As per the discussion above there seems to be a high demand in roles related to fullstack developers, UI UX designers, Data Anononmization (Data Lake), big data resources with kalfka, python devs, dev ops, agile coach, AI, Information Security and Risk compliance and finding talent skilled in these areas seems to be scarce hence it may still remain a challenge. Interviewing potential candidates can end up being a nightmare interview experience for the Candidate and even more so in the Interview Panel round when the members are not motivated enough. As Talent Acquisitionists you are all too familiar with nightmare interview stories being on the receiving end at some point in time. And so you can relate to it having had first-hand experience when the panel members are not motivated thus hampering their effectiveness. 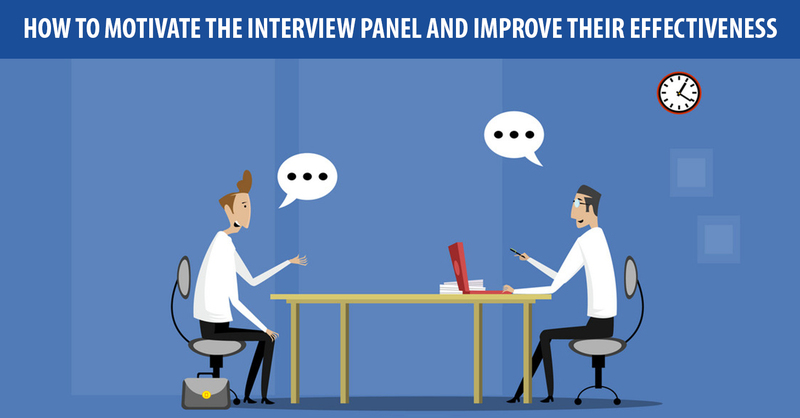 Therefore it really comes down to answering the question How to motivate the interview panel and improve their effectiveness in the hiring journey? The conversation above had some great insights to add like training the panel for effective interviewing and to make good hiring decisions, ensuring that you have experienced panel members is also important. In the event of not enough experienced members then conducting shadow recruiting programs, you can also ensure that the panel is made comfortable and interviews are conducted in their convenience while making sure the tools utilised for conducting interviews via phone screens are working effectively. These are some of the great ways to not only motivate panel members but also help them make good hiring decisions. Much of a Talent Acquisitionist’s role revolves around the relationship of the company with the employees that requires one to explore Different Ways to Conduct Post Offer Candidate Engagement. The role essentially calls for strong interpersonal communications skills as interactions and building relation activities with new joinees is important to prevent post offer dropouts. Activities that foster relationship building are conducted so as to minimise the post offer dropout’s ratio. Failing that it all comes down to a post offer candidate engagement experience being a good one. Ensuring that the newly on boarded candidate has a good engagement experience is therefore an essential necessity where organisational growth is concerned. With that being said we @SourcingAdda conduct discussions in an attempt to answer the queries most Talent Acquisitionists are faced with on a regular basis. 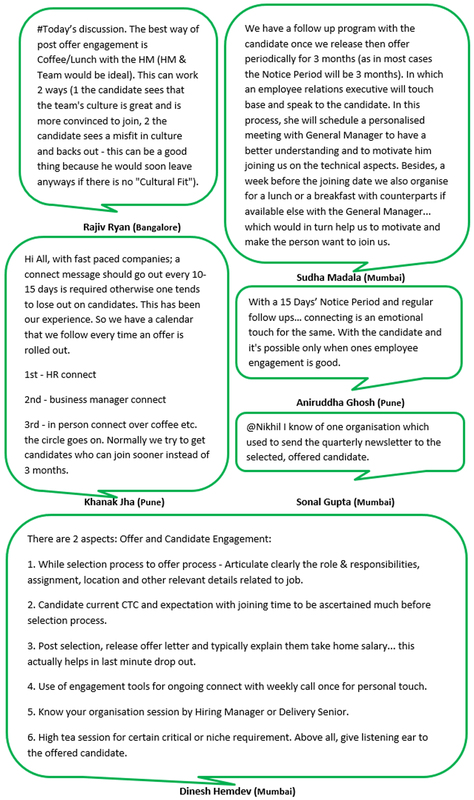 And thanks to one of our Bangalore group members Champa’s topic suggestion covered these aspects with a discussion on, “Different ways to conduct post offer candidate engagement” that was conducted with interesting insights to be implemented and highlighted below for your review…. Based on the conversation above I think it’s safe to say that Post offer candidate engagement is more important once the candidate is on boarded. And there are several options mentioned like sending a quarterly company newsletter, know your organisation session by Hiring Manager or Delivery Senior, include them in as many team building events as possible such as team lunch, meetings, afterhours get-togethers, etc. 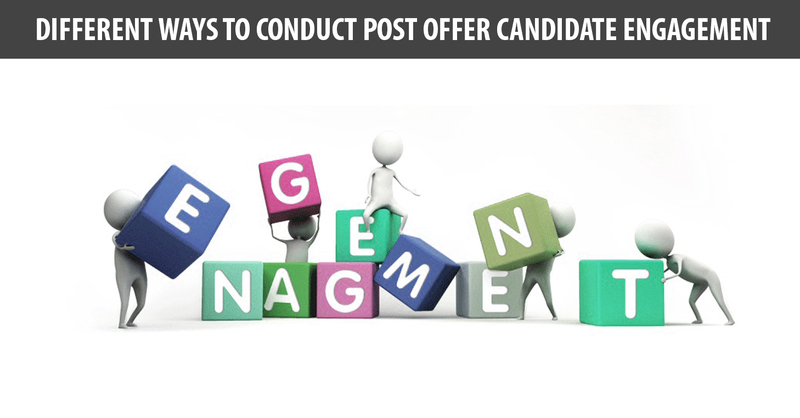 as mentioned by Nikhil and as Rajiv rightfully mentioned a Coffee / Lunch with the HM (HM & Team would be ideal) are some of the various options mentioned which you can utilise to boost your Post Offer Candidate Engagement.